BEIJING (AP) — The release of the Chinese Nobel Peace laureate Liu Xiaobo's widow from eight years of house arrest this week brought some comfort to China's activists. But the rare triumph for human rights in China was short-lived: Her brother was forced to stay behind, ensuring Liu Xia stayed silent on the one-year anniversary of her husband's death Friday. BEIJING (AP) — China on Wednesday sentenced a veteran pro-democracy campaigner to 13 years in prison on vaguely defined subversion charges, one day after releasing the widow of a Nobel Peace Prize laureate after eight years of house arrest. The United States is welcoming the release of poet Liu Xia after eight years under house arrest but voicing concern for her brother who remains in Beijing. Liu Xia, the widow of the late Chinese Nobel Peace Prize laureate Liu Xiaobo, arrived in Germany on Tuesday. GENEVA (AP) — A group of U.N. human rights experts are expressing concerns about the health of the widow of late Nobel Peace Prize laureate Liu Xiaobo, saying the Chinese government should let her seek treatment wherever she wishes. The independent experts commissioned by the U.N.'s Human Rights Council reiterated their call to Chinese authorities to indicate where Liu Xia is being held, and to release her. HONG KONG (AP) — Police in Hong Kong stopped about 20 pro-democracy protesters from getting near a flag-raising ceremony Sunday marking the anniversary of the city's handover from Britain to China. The protesters carried a coffin symbolizing a death of democracy and chanted slogans against one-party rule in China, demands for universal suffrage in Hong Kong and mainland China and freedom for Liu Xia, the widow of Nobel Peace Prize winner Liu Xiaobo. BEIJING (AP) — U.S. Secretary of State Mike Pompeo has urged China to disclose the details of people killed, detained or missing during the Chinese military's crackdown on pro-democracy protesters centered on Beijing's Tiananmen Square 29 years ago. BEIJING (AP) — China on Thursday rejected an appeal from dozens of writers and artists for the release from house arrest of the widow of Nobel Peace Prize winner Liu Xiaobo. 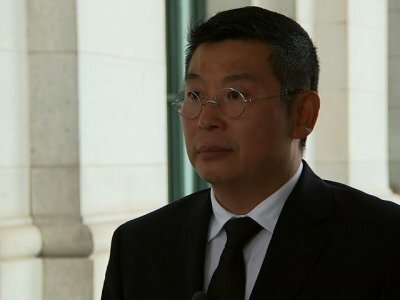 Foreign Ministry spokesman Lu Kang told reporters that Liu Xia's right to travel was an issue for the Chinese government alone to determine. BEIJING (AP) — Germany said Thursday it would welcome the widow of Chinese Nobel Peace laureate Liu Xiaobo after a recording was released of her crying in desperation and indicating she has given up hope of being able to leave China. "If I can't leave, I'll die in my home," Liu Xia said during a recent phone call with her close friend Liao Yiwu, a writer who documented their conversation in an essay published Wednesday. BEIJING (AP) — A video has surfaced online showing the wife of Liu Xiaobo for the first time since the funeral of the Nobel Peace Prize laureate, who died in Chinese custody last month. The video shows Liu's widow, Liu Xia, saying in a hoarse voice that she hopes her friends will give her space to grieve. HONG KONG (AP) — The strange case of a Hong Kong pro-democracy activist who claimed mainland Chinese agents stapled his legs as a warning has taken another twist after police arrested him Tuesday on suspicion of providing false information. Howard Lam made waves last week with his eye-catching allegations, which rekindled fears about Beijing interfering in Hong Kong despite promising it considerable autonomy since the 1997 handover from Britain. But police said his story didn't check out. HONG KONG (AP) — A Hong Kong pro-democracy activist said Friday he was briefly abducted and tortured by suspected mainland Chinese security agents who stapled his legs as a warning against sending a signed photo of soccer star Lionel Messi to a dissident's widow. UNITED NATIONS (AP) — The U.N. human rights chief said Thursday he intends to keep pressuring China to allow the wife of the late Nobel Peace Prize laureate Liu Xiaobo to move freely and leave the country if she wants to go elsewhere. Zeid Ra'ad al-Hussein told a group of reporters Thursday that he intends to meet with Chinese officials when he returns to Geneva to stress the appeal he made after Liu died of liver cancer on July 27 for the lifting of restrictions on Liu Xia's movements. BEIJING (AP) — From a waterfront concert in a Hong Kong park to a quiet candlelit prayer in a Melbourne alley, Liu Xiaobo's supporters around the world gathered Wednesday to mark the traditional Chinese observance of the seventh day after the imprisoned Nobel Peace Prize laureate's death. Liu Xiaobo, the imprisoned Chinese Nobel Peace Prize laureate, died at the age of 61 after a battle with liver cancer. The declining health of China's most prominent political prisoner had become the subject of international attention, with supporters and several foreign governments calling for him to be freed on humanitarian grounds. Chinese authorities have largely squelched any attempts to publicly voice support for Liu, whose name is a banned search term on Chinese social media sites and news search engines. SHENYANG, China (AP) — Family members of Liu Xiaobo scattered the Nobel Peace Prize laureate's ashes into the sea on Saturday in funeral proceedings closely orchestrated by the Chinese government following his death from cancer while in custody. Liu's supporters said the move was intended by the authoritarian government to permanently erase any traces of China's best-known political prisoner, who died Thursday at the age of 61. SHENYANG, China (AP) — China cremated the body of imprisoned Nobel Peace Prize laureate Liu Xiaobo, who died this week after a battle with liver cancer amid international criticism of Beijing for not letting him travel abroad as he had wished. 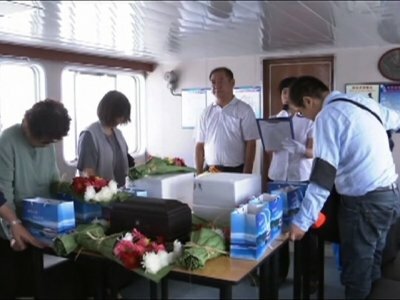 The government of the city of Shenyang in northeastern China, where Liu had been treated for advanced liver cancer, said in a briefing that the cremation took place early Saturday morning in a ceremony attended by family, including his wife. WASHINGTON (AP) — The death of Liu Xiaobo is a catastrophic loss for China and the entire world, and his contributions to human rights should never be forgotten, members of Congress said during a hearing Friday that turned into a memorial for China's most prominent political prisoner. In this photo by Associated Press photographer Kin Cheung, flowers and messages of condolence are left for Chinese Nobel Peace Prize laureate Liu Xiaobo at the Beijing government office in Hong Kong. Kin said groups of mourners, some in tears, came to the site as less than 10 police officers stood guard nearby. The career of writer and Nobel Peace Prize laureate Liu Xiaobo intersected often with China's pro-democracy movement. He considered the 1989 Tiananmen Square protests a turning point of his life and his death provoked grief and dismay from fellow activists, who vowed to not let his influence wane. A look at the milestones in the Chinese democracy movement and Liu's involvement. BEIJING (AP) — Liu Xiaobo, who died Thursday of liver cancer, was a prolific writer of essays, literary criticism and poetry, whose political activism was the basis of four prison terms in China and the 2010 Nobel Peace Prize. A selection of Liu's writings and comments from the Nobel Committee and Chinese authorities. SAN FRANCISCO (AP) — World leaders and human rights advocates expressed sorrow and anger Thursday over the death of Nobel Peace Prize laureate Liu Xiaobo, who died in police custody while being treated for advanced liver cancer in prison. SHENYANG, China (AP) — Imprisoned for all the seven years since he was awarded the Nobel Peace Prize, Liu Xiaobo never renounced the pursuit of human rights in China, insisting on living a life of "honesty, responsibility and dignity." China's most prominent political prisoner died Thursday of liver cancer at 61. The career of Liu Xiaobo, China's most prominent political prisoner who died Thursday, intersected various times with the country's pro-democracy movement until his final imprisonment in 2008. Liu, a Nobel Peace Prize laureate, was a lecturer, writer and literary critic. Below is a look at milestones in the drive for greater Chinese political freedom, openness and accountability beginning with the 1978 democracy movement up to the present day, along with Liu's role. SHENYANG, China (AP) — Friends of China's ailing and imprisoned Nobel Peace Prize laureate Liu Xiaobo have made their way to his hospital at the risk of being detained by the authorities, saying they want to show their support in what could be his final moments. SHENYANG, China (AP) — Imprisoned Chinese Nobel Peace Prize laureate Liu Xiaobo's condition is life threatening with multiple organ failure and his family has opted against inserting a breathing tube needed to keep him alive, the hospital treating him said. Liu, who has advanced liver cancer, is suffering from respiratory and renal failure as well as septic shock, the First Hospital of China Medical University said on its website Wednesday. BEIJING (AP) — As China's government faces mounting international pressure to grant imprisoned Nobel Peace Prize laureate Liu Xiaobo his wish to leave the country for treatment of advanced liver cancer, it's fighting back with a familiar strategy: information control. 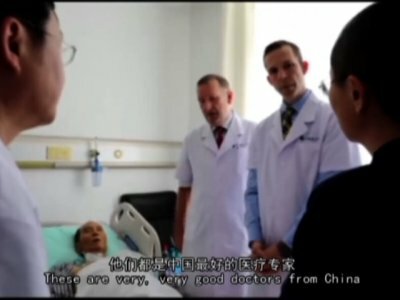 BEIJING (AP) — Chinese doctors were working to treat critically ill Nobel Peace Prize laureate Liu Xiaobo, as the government hardened its position against growing pleas to allow China's best-known political prisoner to leave for treatment overseas. Dozens of people are staging a sit-in protest in Hong Kong urging China to allow ailing Nobel Peace Prize laureate Liu Xiaobo to be treated for late-stage liver cancer overseas. The activists waved banners and chanted slogans as they marched Monday to the Chinese government's representative office. 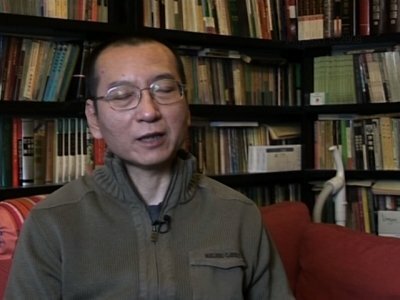 BEIJING (AP) — Two foreign specialists who visited Liu Xiaobo said Sunday that the cancer-stricken Nobel Peace Prize laureate can safely travel abroad for treatment, apparently contradicting statements by Chinese experts who say a medical evacuation would be unsafe for China's best-known political prisoner. BEIJING (AP) — American and German specialists saw imprisoned Chinese Nobel Peace Prize laureate Liu Xiaobo on Saturday and confirmed that he is in the final stages of terminal liver cancer, the hospital treating him said. China allowed the two doctors to travel to the northeastern city of Shenyang to see the country's most prominent political prisoner following international criticism of Beijing's handling of Liu's illness and calls for him to be treated abroad. BEIJING (AP) — China's imprisoned Nobel Peace Prize laureate Liu Xiaobo's two brothers were being allowed to travel to a northeastern city to visit him in a hospital Saturday, a friend and a former lawyer said, as concerns mounted over his deteriorating health. BEIJING (AP) — A Chinese medical team charged with treating imprisoned Nobel Peace laureate Liu Xiaobo has stopped using cancer-fighting drugs so as not to overwhelm his severely weakened liver, raising concerns that China's most prominent political prisoner is critically ill.